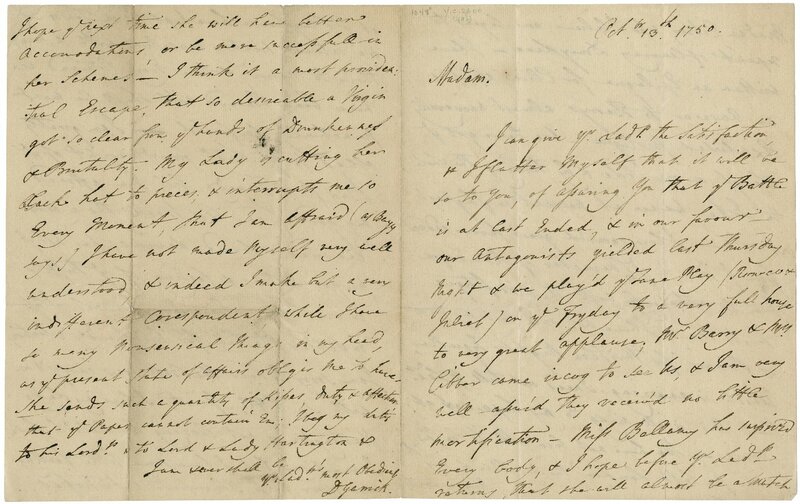 The Folger collection includes some 60,000 handwritten documents dating from the 15th to the 21st century. Many of the manuscripts were the tools of everyday life in the 16th and 17th centuries—letters, wills, inventories, recipes, and real estate transactions—while other documents illuminate the worlds of the theater and the court. The Folger’s manuscripts offer unique windows into life in Shakespeare’s time, later writers' fascination with Shakespeare, and the development of the English theater over the centuries. Some highlights of the collection are shown here, with more information about the scope of our manuscript collection below. The three manuscripts of 15th-century allegorical dramas known as the Macro Plays are the earliest morality plays in English to survive in their entirety. Named for their 18th-century owner, the Suffolk antiquarian Cox Macro, these handwritten pages are undoubtedly some of the greatest treasures of The Folger Shakespeare Library. Without these unique plays—given the titles Wisdom, Mankind, and The Castle of Perseverance by the 19th-century scholars who first transcribed and published them—we would know virtually nothing about pre-Reformation forms of this drama. Featured above is the last page of The Castle of Perseverance. 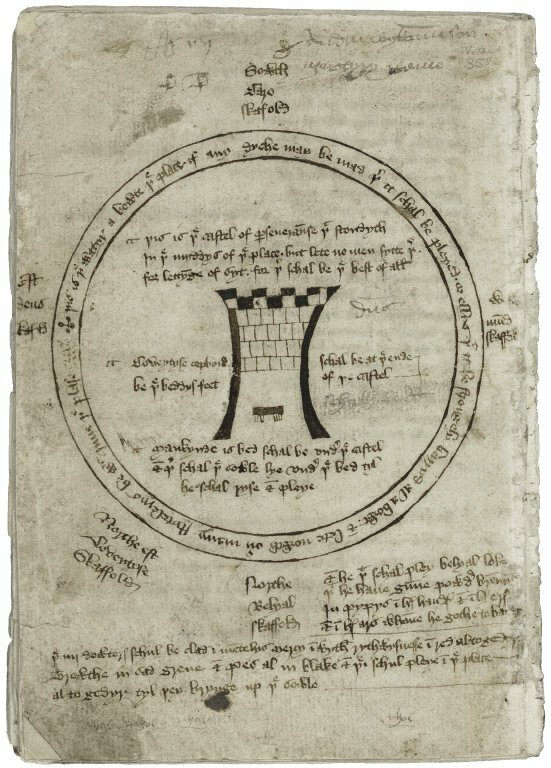 It contains the earliest known stage diagram for an English play and is thus an invaluable record of early performance history. The diagram depicts a stage in the round with a castle at its center surrounded by five scaffolds designated as the locations for the allegorical characters representing God, the World, Flesh, Covetousness, and the Devil. You can explore the full manuscript of the Macro plays in our digital image collection. New Year’s gift roll of Elizabeth I, Queen of England [manuscript], 1584/5 January 1. Created in 1585, the 27th year of Queen Elizabeth’s reign, this New Year’s gift roll documents the long-standing custom of presenting the monarch with gifts on New Year’s Day. One of six gift rolls held by the Folger, this particular example is written on 11½ feet of vellum, and is signed by Queen Elizabeth at both top and bottom on each side. In addition to listing the gifts presented to her on the front, on the reverse the roll also records her gifts in return (always in the rather unimaginative, if valuable, form of gilt plate). 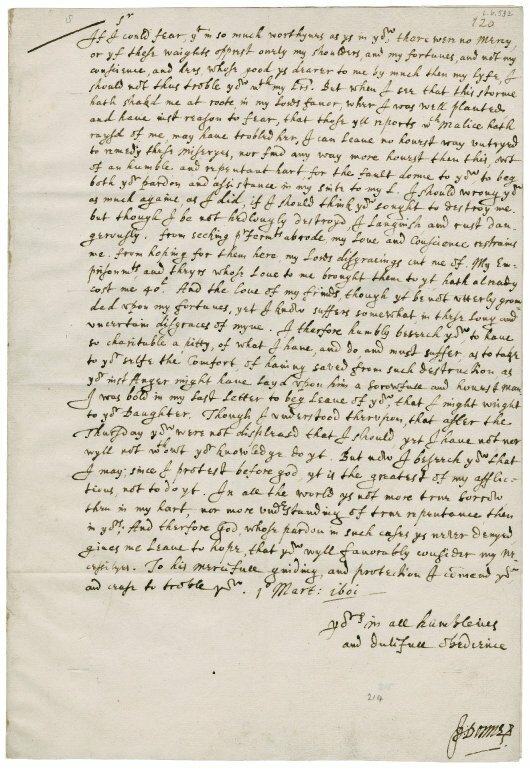 The Folger holds the buyer and seller copies of the Final Concord for Shakespeare’s purchase of New Place, his home in Stratford-upon-Avon, from William Underhill. Upon purchasing property, the vendor and purchaser would enter into an agreement through the Court of Common Pleas. 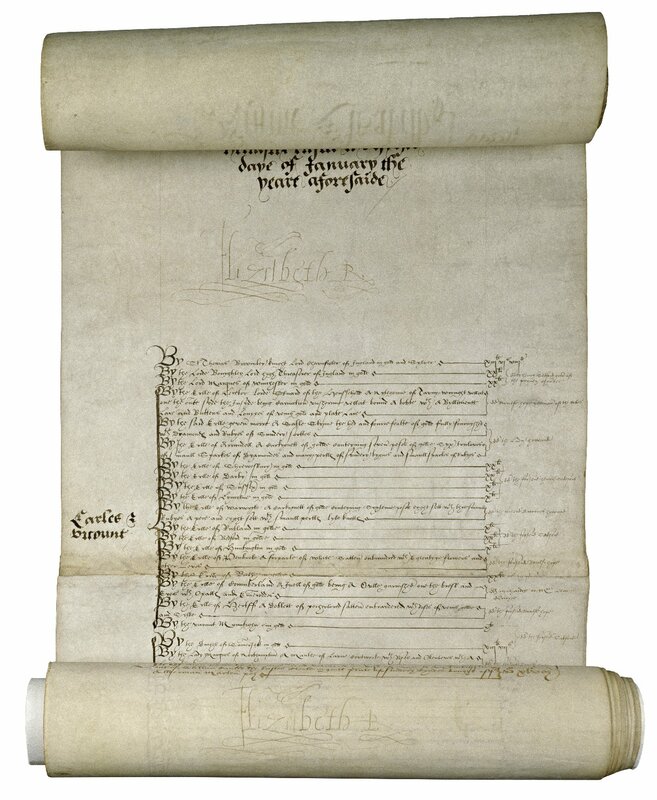 This agreement resulted in a three-part indenture, copied three times and divided so that Shakespeare and Underhill would each receive a copy, with a third retained by the courts. Shakespeare had to undergo this process twice, in 1597 and then in 1602, as William Underhill was murdered by his eldest son soon after the 1597 final concord. His youngest son and heir, Hercules Underhill, could have legally challenged Shakespeare’s claim due to the closeness of these events, and so the process was repeated. The vendor and purchaser’s copies shown here both belonged to Shakespeare, as Hercules Underhill apparently never received his. The court copy, or foot of fine, is held by the National Archives in the United Kingdom. Trevilian, Thomas, b. ca. 1548. The Trevelyon Miscellany is undoubtedly one of the Folger’s greatest treasures. In 594 oversized pages, it depicts life in Shakespeare’s England in all of its brilliant complexities—from the mythical to the mundane, poetical to practical, religious to secular. Ostensibly created for the entertainment, education, and edification of his friends and family, Thomas Trevelyon’s manuscript continues to delight and mystify modern audiences with its familiar scenes of domesticity and husbandry intertwined with epic Biblical and national pictorial histories. A monumental work that was intended to be both studied and enjoyed, it provides an exciting and unparalleled snapshot of the passions, concerns, and everyday interests of a highly talented London commoner. 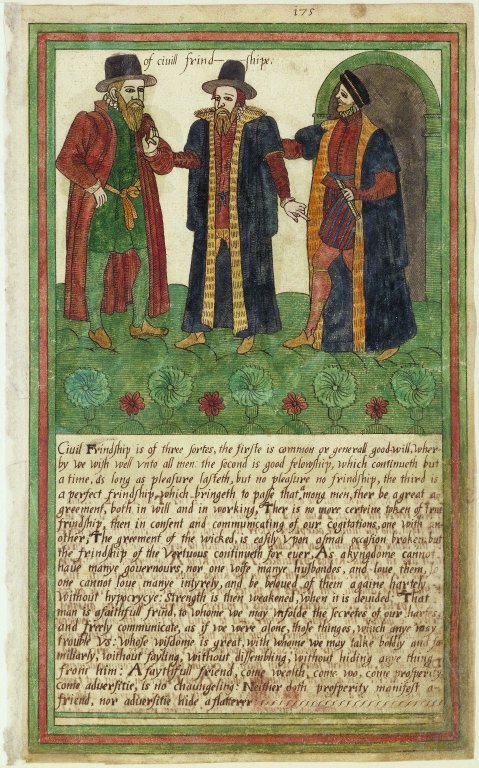 The leaf featured here is Trevelyon’s touching discussion of “ciuill-frind-shipe” below a colorful image of three gentlemen. The entirety of the Trevelyon Miscellany can be explored in our digital image collection. This is one of 13 letters by the 17th-century poet John Donne held at the Folger, a collection that makes up about a third of his surviving letters. Eight of them, including this one, illuminate a crisis in Donne's life triggered by his secret marriage in late 1601 to Anne More, daughter of Sir George More of Loseley Park. By marrying Anne without her father's permission, Donne offended against both civil and canon laws. He soon found himself jobless, in prison, and barred from communication with his bride. Donne responded with an outpouring of eloquent, pleading letters to Sir George More and to Sir Thomas Egerton, his former employer (and his wife's uncle). In this one to More, Donne writes movingly of Anne, "whose good ys dearer to me by much than my lyfe." The poet's appeals were eventually heeded, and on April 27, 1602, the court of the archbishop of Canterbury confirmed the marriage. Despite some financial difficulties brought on by the scandal, the marriage was a happy one. After his wife's death in childbed in 1617, the great poet vowed never to marry again. David Garrick commanded the London theatrical scene in the 18th century with unprecedented charisma and force. The son of a soldier, he rose to become, in the words of William Pitt, “the best Actor the English Stage had produc’d.” Pitt was not alone in his praise of Garrick, who acted in dozens of roles, many of them Shakespearan, in the course of his nearly 30-year career. His death in 1779 was widely mourned, and he is buried in Poet’s Corner near the monument to William Shakespeare. The inscription by Samuel Jackson Pratt on his monument reads, “Shakespeare and Garrick like twin stars shall shine / and Earth irradiate with a beam divine.” Garrick remains one of the foremost interpreters of Shakespeare’s words and characters, and a towering figure in the history of the English stage. This “Partridge and Cooper’s Patent Improved Metallic Book” contains 172 pages of quotations in the hand of George Eliot, compiled in preparation for her novel Middlemarch. One of two Eliot notebooks at the Folger, it includes extracts from the works of dozens of poets, dramatists, historians, literary critics, philosophers, and mythologists, in English, German, French, Latin, Greek, Hebrew, Italian, and Spanish. The collected material represents her attempt to identify the “history of man,” as she calls it in the first sentence of the novel. The leaf featured here, headed “Fine declamation,” includes quotations from Milton’s Samson Agonistes, Shakespeare’s King Lear and Macbeth, and extracts from Charles Knight’s editorial comments in his second edition of the Works of William Shakespeare (1842-1844). In nearby pages she also quotes from Henry VIII, Julius Caesar, A Midsummer Night’s Dream, Timon of Athens, and Shakespeare’s sonnets, as well as Tennyson, Horace, Swinburne, and Byron. In 2012, the Folger acquired the theatrical archives of actress and playwright Lynn Redgrave (1943–2010). The collection encompasses a variety of materials representing every stage of Redgrave's career: her theatrical debut in A Midsummer Night’s Dream in 1962, her successful Hollywood career, and her own writing for the theatre in four deeply personal family plays—Shakespeare for My Father, The Mandrake Root, Nightingale, and Rachel and Juliet. Redgrave’s papers include scrapbooks documenting her early stage success as well as promptbooks and other production materials for her many plays, films, and work for television. The collection also contains materials related to her father, Sir Michael Redgrave, and an extensive correspondence with her mother, actress Rachel Kempson. 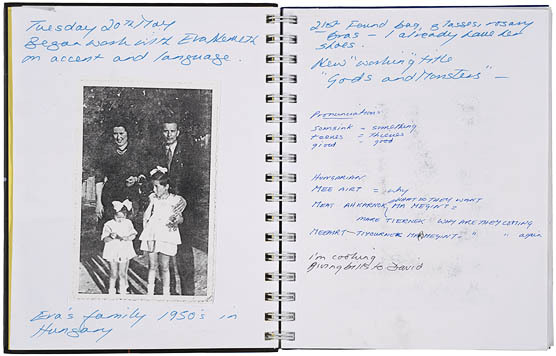 The featured image is a sample from her 1998 character journal for the film Gods and Monsters, and provides one of many fascinating glimpses into her process and history as one of the foremost actresses and Shakespeareans of our time. One of the Folger’s prized possessions is Lady Mary Wroth’s 17th-century sonnet sequence, Pamphilia to Amphilanthus, written out in her own hand with corrections. Other literary manuscripts include commonplace books, in which men and women wrote selections from sermons, poetry, or plays that appealed to them. Among these is a large collection of literary quotations that novelist George Eliot put together while writing Middlemarch. The Folger archives also include the papers of Delia Salter Bacon, who questioned Shakespeare’s authorship of the plays, as well as those of 18th-century Shakespeare-forger William Henry Ireland. One highlight of the Folger’s theatrical manuscripts is the earliest known copy of Shakespeare’s plays—a conflated version of the two Henry IV plays belonging to Sir Edward Dering. The business side of theater is reflected in deeds for purchases and lease of properties at Blackfriars by Shakespeare and his fellow actors, as well as records for purchases and receipts at Drury Lane Theatre in the 18th and 19th centuries. The papers of David Garrick and his circle shed new light on Garrick's larger-than-life 18th-century career as an actor, manager, adapter, and Shakespeare promoter extraordinaire. Love letters, deeds, and news from family and court are all found among the large 16th- and 17th-century collections of papers from the Bagot, Bacon–Townshend, Rich, Ferrers of Tamworth, Cavendish–Talbot, and Loseley families. 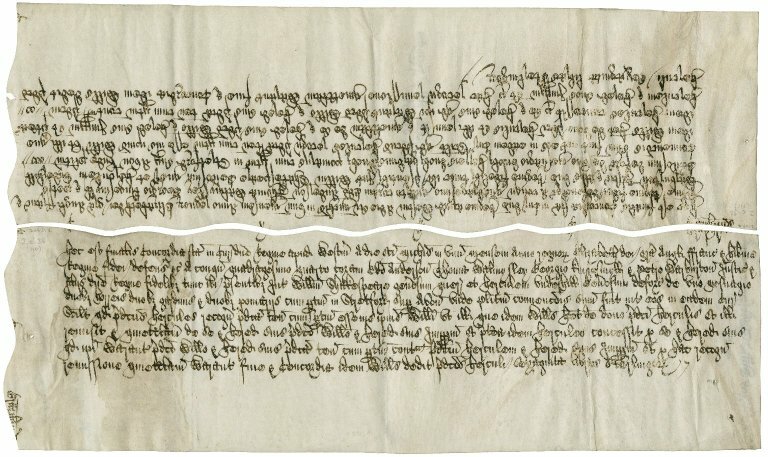 The Losely papers have important documents related to the Office of Revels (responsible for festivities at court) under Sir Thomas Cawarden (d.1559); letters relating to the house arrest of Mary Queen of Scots appear in the Cavendish–Talbot papers. A separate group of recipe books shows how families preserved knowledge about food, medicinal remedies, and beauty secrets. Other large archives include the Newdigate newsletters, reporting on politics, commerce, and social affairs in 17th-century England and Europe; the Clayton–Morris collection of early financial documents; the editorial papers and correspondence of the Nichols family (who published the Gentleman's Magazine); and 200 volumes of transcripts from the papal and Venetian archives, formerly owned by the Strozzi family. A large collection of scrapbooks from the 19th-century Shakespearian John Orchard Halliwell–Phillipps contains a varied group of materials relating to Shakespeare and the theater of his time. The Folger also holds the papers of William Winter, writer and critic of the late 19th and early 20th-century stage.